Once your online booking is set up on your website, click the booking button. This will take you to your online booking portal. They can then select which items they would like to book by clicking the '+' icon under the correct items. When the correct items are chosen, click 'next' in the bottom right. Your customer can then choose which available time slot they would like to book into. After choosing a time that works for them, they click 'next' to move on to the last step. They then enter their personal information including name, contact information and service address. 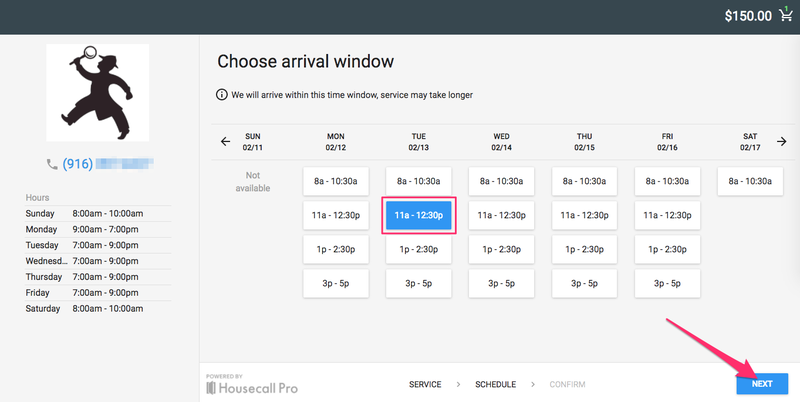 This information will automatically push into your Housecall Pro calendar and customer database. Then they just click 'confirm' and the job has been booked! Learn more about why online booking is right for your business.